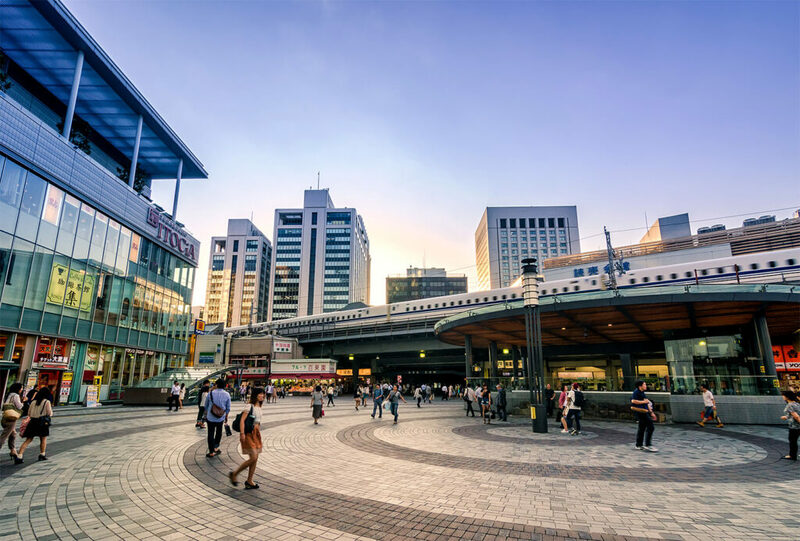 Yurakucho Station有楽町駅・ゆうらくちょうえき (有楽町: 有 – there is 楽 – fun in this 町 – town), was first opened in 1910 and is a small station with just four above ground platforms and two subway platforms. The station is surrounded by many 居酒屋いざかや・Izakaya and outdoor 焼き鳥やきとり・Yakitori eateries, many built right underneath the train tracks. The presence of all these restaurants makes 有楽ゆうらくちょう・Yurakucho a favorite hangout for Japanese サラリーマンsalaryman after a hard day at the office. There’s more than just restaurants though as the area is packed with other cultural venues. Want to see a Broadway play or some other musical or stage performance? The 東京国際フォーラムとうきょうこくさふぉーらむ・Tokyo Kokusai Forum Hall is just across the street from the station, with the 東京宝塚劇場とうきょうたからづかげきじょう・Takarazuka Theater not far in the opposite direction. The southwest corner of the Imperial Palace皇居・こうきょ and grounds are two blocks to the west of Yurakucho, as is 日比谷公園Hibiya Park・ひびやこうえん. The glamorous shopping district of 銀座ぎんざ・Ginza is just one block to the east. The DN21 Building, the base of the occupational government after Word War WII厚生労働省・こうせいろうどうしょう is also nearby.